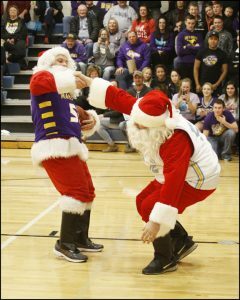 Sports fans attending the home basketball game for the non-conference match up of Lynnville-Sully versus East Marshall on Thursday, Dec. 22, enjoyed some festive entertainment. Shane Ehresman, L-S Superintendent, battled it out in a game of one-on-one during halftime of the boys’ game against East Marshall’s high school principal, Matt Rasmussen, former Lynnville-Sully Principal. The two administrators dressed up as Santa Claus, each sporting their school’s respective jerseys. Rasmusson lends a helping hand to Ehresman in their holiday match up.